Eminent teachers having National level recognition. Varied courses including Prak Shastri, Shastri, Acharya, Shiksha Shastri, VidyaVaridhi and Diploma in vastu. Teaching of Vyakarana, Jyotisha, Mimamsa, Nyaya,Vedanta, Sahitya and Shiksha Shastras. 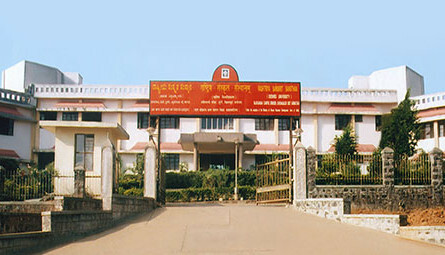 Facility to study modern subjects such as Hindi, English, Kannada, History, Computer Science, and Physical Education along with traditional shatras. Swadhyaya Kendra of Mukta Swadhyaya Peetham (Institute of Distance Education) for those who cannot study through regular mode. Diploma Course in Vasthu Shastra to get expertise in Vastu. Guidance for Research in Shastra Field. Training of Sanskrit Teachers for the Enhancement of Teaching Skills. Sanskrit is the medium of instruction and communication. Vagvardhini Parishad for enriching spoken Sanskrit and shastraic skills. Sharada Vishishta Vyakhyana Mala and Vakyartha Parishad for the improvement of shastraic thinking and to enrich the attitude towards Studying Shastra. Encouragement for Indian cultural notions such as music, drama, sports etc..
Special training for the talented students to participate in various national level and state level competitions. Jagadguru Sri Sri Bharati Teertha Gold medal (in memory of the parents of Padmashree Dr. V. R. Gowrishankar, administrator, Sringeri Muth) and other endowment prizes for the campus students who have secured highest marks in different Shastras at Prak Shastri, Shastri, Acharya and Shiksha Shastri level. Well facilitated Hostel for students (Boys & Girls) arriving from different regions. Midday meal Sharada Prasada for students, from Sri Muth, Sringeri.